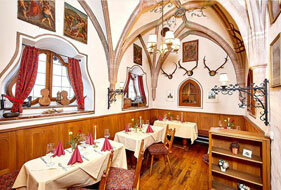 Our hotel offers cosy accommodation with Bavarian ambiance and excellent food. You have the choice betwee: single, double, triple and quadruple rooms. There are also two apartments with bedroom and a separate room with a corner bench and a balcony. landline telephone and satellite system and a hairdryer. Some rooms have a balcony with the view of the Karwendel. Most popular are the rooms at the front side with the view to the unique fresco paintings. Our friendly staff looks forward to welcome you and your family or business partner. A free bottle of soda is provided in your room. Dogs are allowed and free of charge. Get half board for free if you stay at least four nights! If you book for three nights, half board is charged at 12 € per person per day! It is worthwhile to make longer holidys! Accommodation in a lovely room for seven nights • rich breakfast buffet, champagne on Sunday, salmon and trout. All the seven evenings, you can compose your half board dinner from the daily three course meal from our extensive standard menu. and one welcome-drink is included. Family suite with separate room for children on request. Pets (on request) free! The prices above include a rich breakfast buffet, plus the residency tax. 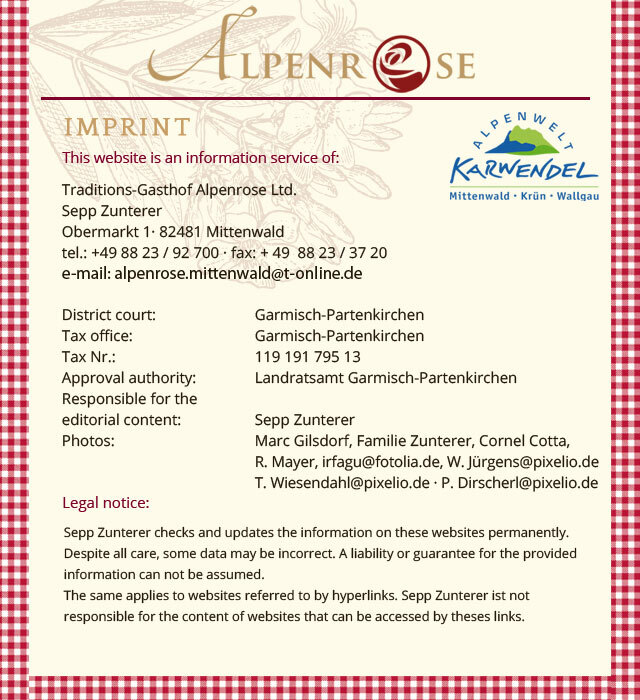 Please understand that there is no more discount possible for our packages. 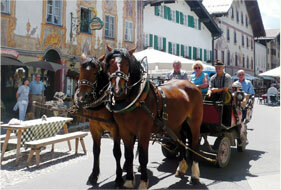 The above offers are available all year round, except for Christmas and New Year. 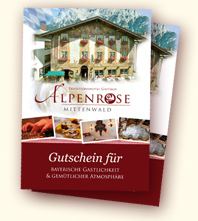 Give away Bavarian hospitality as a gift!